This beachfront condo is a 1600 square foot, sixth floor unit with a large balcony looking down at the Gulf of Mexico and beach. The 180 degree view is unobstructed by any buildings. From your balcony lounge chair enjoy a dramatic sunrise looking east towards downtown Sarasota or a sunset looking west at the Gulf. Access to the balcony is available from all rooms. High speed internet and Wifi is provided. The large master bedroom has a flat screen TV, king-sized bed, generous walk in closet, new vanity, bathroom with elegant shower, and a floor to ceiling window overlooking the beach. The second bedroom/den contains a large sleeper sofa, flat screen TV, stereo, DVD player, closets and has its own private bathroom with tub. The living room has a large 42 inch TV as well as a sofa/sleeper and piano. A floor to ceiling sliding door opens on to a balcony with a direct view of the beach and downtown Sarasota. The kitchen is well stocked and has all modern appliances including a dishwasher and garbage disposal. One can snack at the kitchen counter or dine more formally in the dining room. Same floor laundry facilities are just down the hallway. A delightful balcony is furnished with table and chairs, as well as a lounge chair. There is a 3 (THREE) month minimum rental period. The rental fee is $3500 per month during the winter season and $3000 during the "off season". A refundable $425 damage deposit is required. There are no extra fees. Lower rates can be negotiated for long term rentals. Marc Grinberg, the owner, has lived in Sarasota for 40 years and is a practicing physician. Ideal beach front Lido Key/ Sarasota condo. Roomy condo directly on the Gulf of Mexico with private beach access and beach side pool. Private beach access, heated beachside pool, his and her exercise rooms, gorgeous interior, party room(available for private rental), library, internet/TV cable, reserved/covered parking space, great location with easy access to St. Armand's Circle, Longboat Key and Sarasota. Next door to the Ritz Carlton. On-site condo manager and staff. This intimate, residential property has it all. No smoking or pets. I stayed in this gulf front Lido Key condo for the months of May,June, and July. I wanted a getaway from Napa Valley Vineyards to a sunny,white sandy beach with safety, clean, spa like retreat for a single lady to relax and revitalize myself. I had a perfect experience in this condo. It had much more room and flat screen tv's in each room than I used. The kitchen appliances were all newer. The laundry room right down the hall was most convenient. Most important I was just steps away to the beach every morning for my walks. The workout room every night with very impressive equipment. The sea water pool almost all to myself. My car was covered and I was able to walk to St. Armand Circle for the street faires the had was really a fun experience. The condo is not overly fancy , so I did not have to worry about bringing sand or dirt into the unit as I spent my days wandering the beach and in the pool. The location of the condo and the building itself could not be better. My view of the beach and Gulf from my porch was awesome and unobstructed. It was amazing to look out and see dolphins swimming by! The unit and building in general are well maintained and Carmen, the manager, is always available and constantly monitoring the scene. I definitely want to rent this unit again, preferably in the cooler winter and spring months. June and July are a little muggy, even with the gulf breezes off the water. But, was so nice to have the peace and quiet and beauty mostly to myself this time of the year there. I am delighted that your stay at my Lido Beach condo was so enjoyable. Summertime is a bit warm, but the solitude and long,lazy summer days make it worthwhile.We hope to see you again in the cooler winter months. I rented this 6th floor condo for a four month period based on the price and the description in the listing on VRBO. 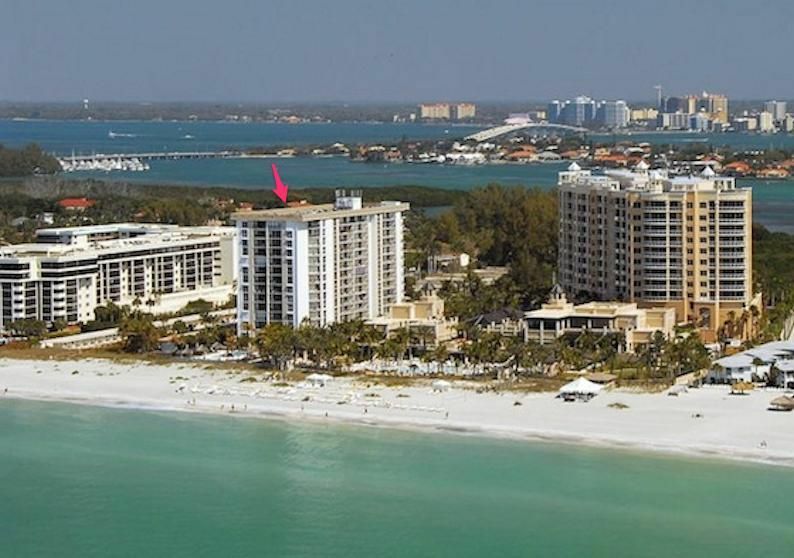 The location of this condo building is ideal, with beautiful beaches on one side and an incredible view of Sarasota on the other. The building is well maintained and beautiful, and is located one mile from St. Armand's Circle with its many shops and restaurants, and it is just a short drive to Siesta Key, Longboat Key, and Anna Maria Island. The amenities include, a very nice pool, an exercise room, a library, a laundry room on each floor, and private gated access to the beach. The manager, Carmen, is very friendly and accommodating, as are the maintenance staff. The people I met in this building were all very nice, and I enjoyed meeting them. In all my conversations with the condo owner, I found him to be very pleasant and he was quickly responsive is resolving any problems encountered in the unit during my stay. The condo itself is spacious and the layout is good. The finishes are dated. I found the photos displayed in this listing do not necessarily reflect the actual condition of the condo. I am glad that the renter had such an enjoyable, positive experience in this Lido Beach gulf front condominium during the 2017 winter season. This spacious condo is the perfect Sarasota, Florida long term (3 months or longer) beach rental. The location and amenities are first class. I am somewhat perplexed by the statement concerning inaccurate photos. The web site photos are all up to date. The only change is that I have added a 3rd large screen TV in the living room. Recently retired, my wife and I decided to try a Florida vacation in order to escape the Vermont cold. We really did not know what to expect and certainly were delightfully surprised by this condo. The building really is on the Gulf of Mexico shore with a private entrance onto the gorgeous Lido beach. The beach view from the condo is most impressive. (There is also a heated pool, but we spent most of our time on the Gulf shore.) The building also has a fully equipped exercise room ,a well stocked library and provides a covered parking spot. There is a very efficient on site manager. The location cannot be beaten. St Armands Circle with its many restaurants and shops is a short walk down the beach. There is a large supermarket several minutes away by car, and nearby Longboat Key has several nice restaurants and is the access to the island communities of Anna Maria and Cortez. Downtown Sarasota is just over the Ringling Bridge. We could see downtown from our condo porch and actually walked there several times (about two and a half miles). I talked with the owner several times by phone and he seemed quite nice and attentive. I really did not have any significant issues for him to rectify. The on site building manager was most helpful for routine questions. I would highly recommend this Lido Key property to anyone wishing to spend the winter months on a Florida beach. My wife and I stayed at the #608 condo at Lido Beach Club during renovations to our Sarasota home. The months while we stayed there, we felt like we were on permanent vacation. The building is perfectly located on the more serene and quiet Lido Key (our favorite beach in Sarasota, despite Siesta Key’s popularity, which we feel is too overcrowded) and a nice walk to all the restaurants and shops of St. Armand’s Circle. The owner was extremely helpful and accommodating to requests, but stayed out of our hair during our stay, which allowed us to feel like the place was our own. The building is located next door to the Ritz Carlton Residences and has private access to Lido beach, as well great accommodations- a new gym, library, serenity garden, a private covered parking space, laundry room, bbq grills, bike storage and a beautiful heated pool. The condo is located on the 6th floor with northwest exposure, making evenings a true treat when my wife and I sipped on a glass of wine while watching the amazing sunsets over the Gulf of Mexico on the large balcony. The condo had all the amenities we could need during our stay, which made things very convenient, from a large walk-in closet, to being fully furnished, dishes, cooking utensils, microwave, cable, flatscreen tvs in every room, fast WiFi, an iron and ironing board, central A/C, a Magic Bullet blender, coffee maker and there is even a piano, but sadly neither my wife nor I play. The condo was spacious, and more than enough room during our stay with the 2 bedrooms (one bedroom currently used as a den) and could easily accommodate someone single, 1-2 couples or a small family. My wife and I really enjoyed our stay and look back on our time there as a pretty magical experience. We often went for runs or long walks on the beach as dolphins swam by, enjoyed swimming in the pool, and riding our bikes to brunch at Blue Dolphin Cafe on the weekends. The rate was very reasonable and we would recommend this rental to vacationers who want to experience the magic of Sarasota during the fall, winter and spring months, or someone local who wants to take advantage of living in paradise everyday, especially when you’d practically have the whole building to yourself during the summer months. Glad that you and Lisi enjoyed your stay while your house was being renovated. Summertime on Lido Beach is serene and special. Walk or jog along the beach adjacent to the condo and pool. Swim or fish in the Gulf of Mexico at your doorstep. Kayak in the mangroves of Sarasota Bay directly behind the condo (kayak rentals available). Walk five minutes to St.Armand's Circle and enjoy the shopping and restaurants. Just over the Ringling Bridge is downtown Sarasota and its many restaurants, art galleries and shops. The world famous John and Mabel Ringling Museum of Art is a brief 10 minute drive away. Boats are easily available for Bay or Gulf fishing. Popular day trips are:Disney World, Boca Grande, and Tampa's Busch Gardens. Monthly Rate: $2500 - $3500 The condo has a 3 month minimum rental policy in order to encourage a stable, residential environment. Long term rentals are desired and long term monthly rental fees are adjusted downwards accordingly. A $375 refundable damage deposit is required with the final rent payment.. There is no cleaning fee.